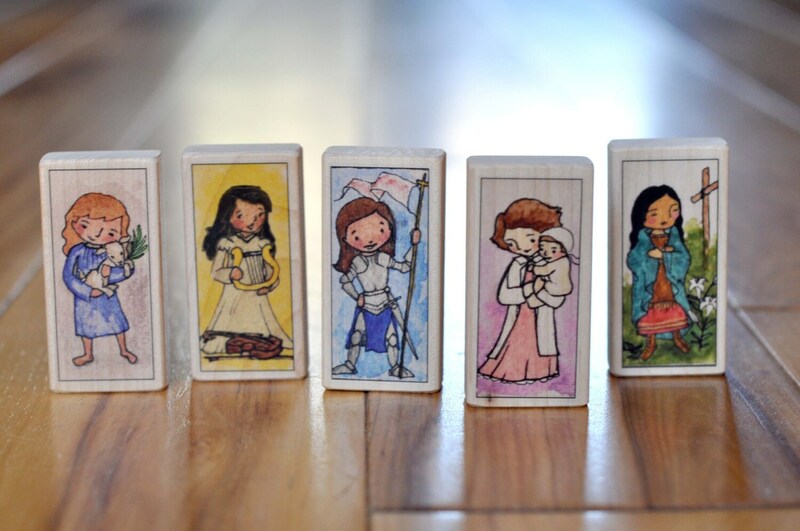 I designed Patron Saint Blocks to be easy to clean, hard to break, beautiful, educational, inspirational and versatile (for tots, little kids, or big kids). Best of all they give the opportunity for prayerful play. These blocks are just the right size for little hands. They can be used for imaginative play, building, stacking or collecting. I have a print of my original watercolor art on the front. On the back there is a quote or a prayer chosen to inspire little ones and the one that cleans up behind them. 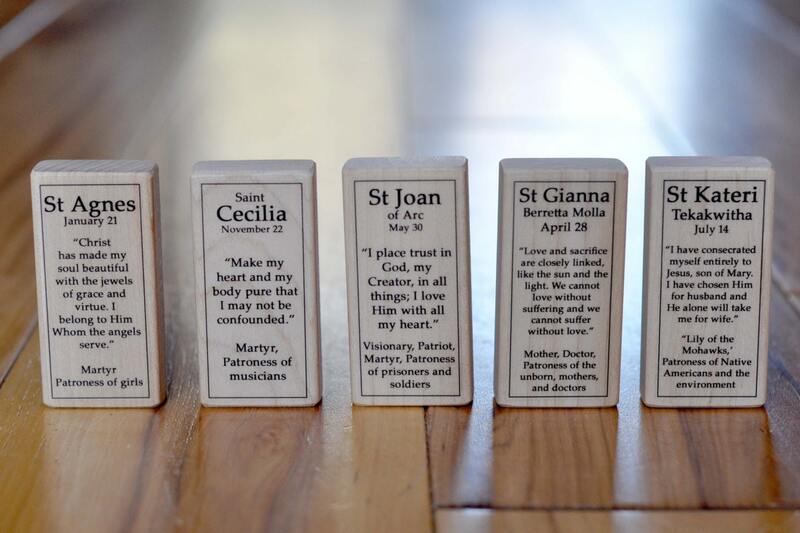 The saint's name, feast day and patronage are also listed - I didn't just want these blocks to be cute, I wanted to give a tiny glimpse of the saint's inspiring story. It is so hard to choose just a few words for each of them, but I hope there is just enough information to be a reminder and an inspiration for further learning. 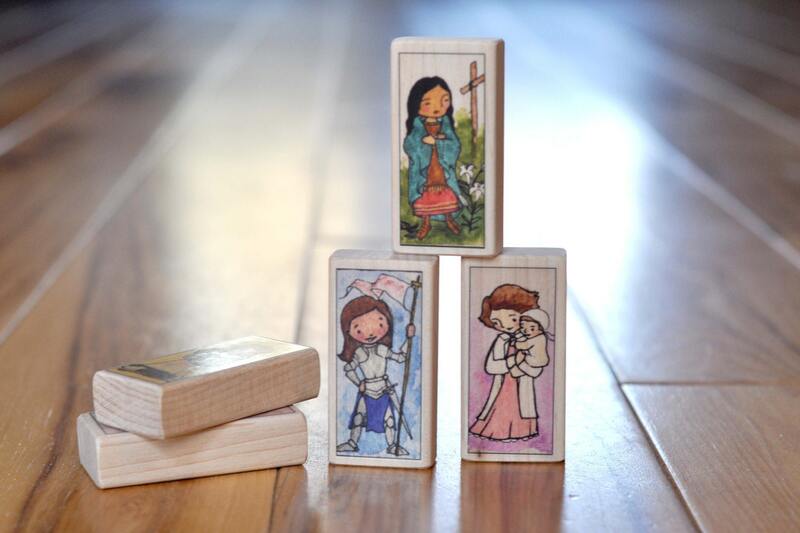 They are made from beautiful precision cut maple blocks that are approximately 2 3/4 inches x 1 1/2 inches x 3/4 inches. They are professionally printed on heavy duty, high-tack, weatherproof polyester paper - the same kind that bumper stickers are made of, which gives them as much baby proof durability as possible. :) They can be easily cleaned with a damp cloth. They come from a smoke-free (and gluten-free) home and are prayerfully designed by a Catholic mom of 5. Orders are mailed in 2 weeks or less and shipped through USPS. If you have a special date that you need them by please let me know and I can probably rush your order. If you are purchasing multiple items I very well may be able to combine shipping and save you money - especially if you are shipping to the US and your shipping total is greater than $13. And if you are ordering 20 blocks or less, your shipping can be manually adjusted to $7. Please just send me a note to make sure I flag it to give you a shipping refund. Don't see your patron on the list? I LOVE making new saint blocks, but they take me hours to research and design so they cost $40 each. Contact me for more details. A beautiful Easter gift! Thank you! Beautiful simple artwork adhered to one side of a blonde wood block with a corresponding info sheet on the back. Bought this "girls set" as a gift for 3yo goddaughter's baptism day. Can easily become part of her playtime things, used with other blocks, brought to church etc. Planning to buy for other godchildren. Perfect Catholic kid gift. Wonderful tool for teaching kids about the saints. AlmondRod Toys went above and beyond to ship the item quickly for me. Thank you!